Antibody 20B11 raised against a piperidinium hapten 1 catalyzes the epoxidation of unsubstituted olefins such as 2, 3, and 4 by acetonitrile-hydrogen peroxide with partial enantioselectivity. 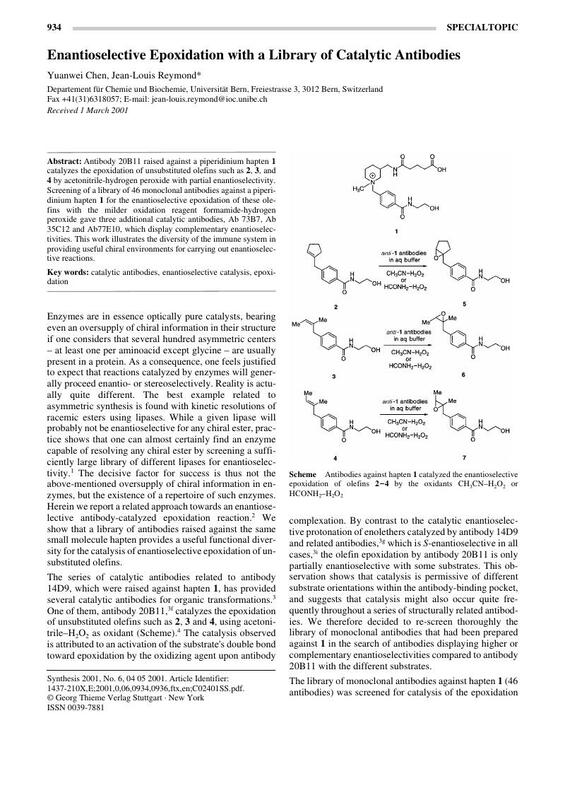 Screening of a library of 46 monoclonal antibodies against a piperidinium hapten 1 for the enantioselective epoxidation of these olefins with the milder oxidation reagent formamide-hydrogen peroxide gave three additional catalytic antibodies, Ab 73B7, Ab 35C12 and Ab77E10, which display complementary enantioselectivities. This work illustrates the diversity of the immune system in providing useful chiral environments for carrying out enantioselective reactions.